It’s been ages since I posted anything. It’s been all systems go here for the past month or so. 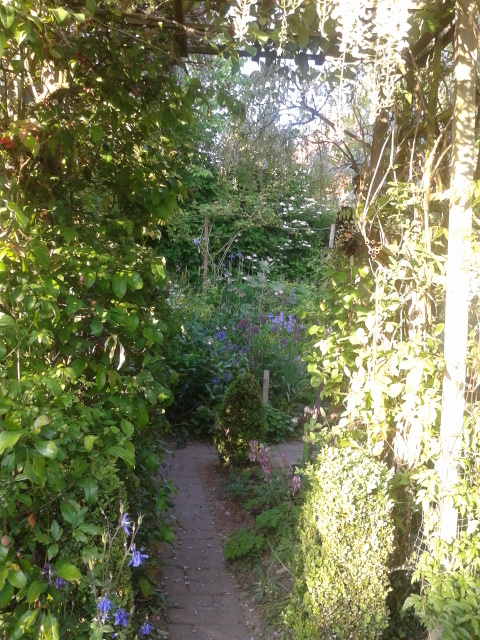 Mr Malc has been repairing fence post and trellis, getting the grass to look presentable and we have pulled so much spanish bluebell foliage up I don’t want to see anymore. 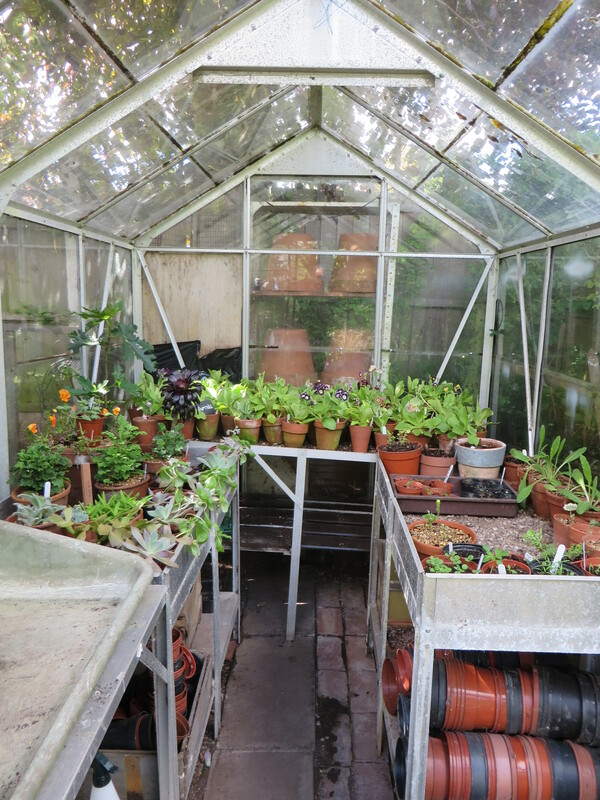 Even the greenhouse has had a makeover. 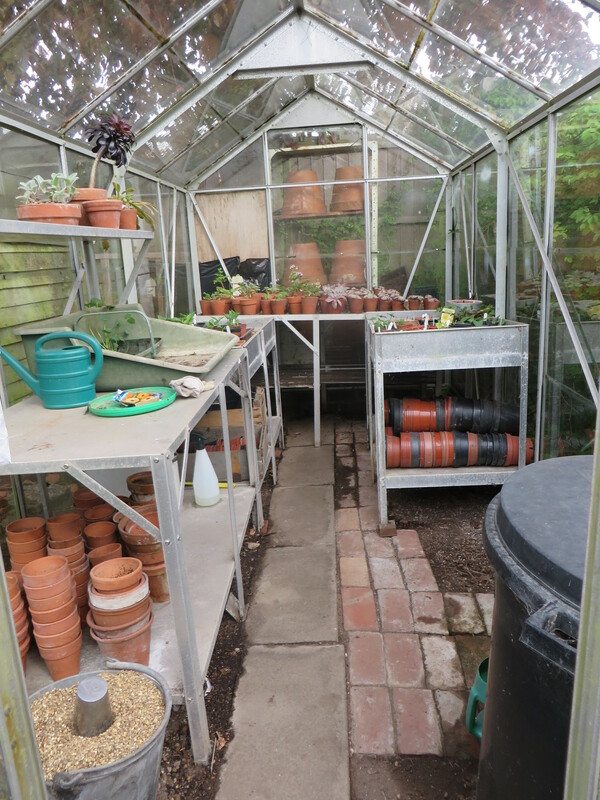 Looking through the back windows you can see large clay pots looking like they are on a slippery slope. 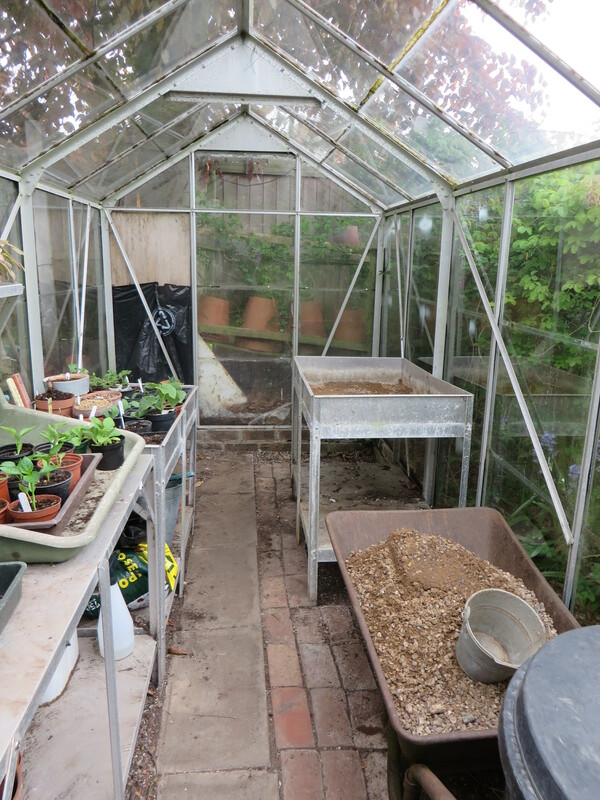 Well that has all changed, the shelving that was in the greenhouse has now gone behind it and a new staging rescued from the allotment now sits along the back of the greenhouse, this will accommodate all of the Auricula from the ladders during the summer. Note the wheelbarrow full of gravel, we had to empty the other staging before we could move it. 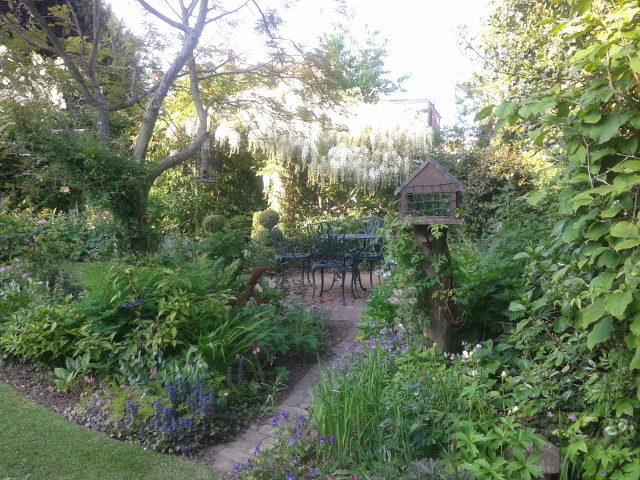 We don’t do things by halves…. 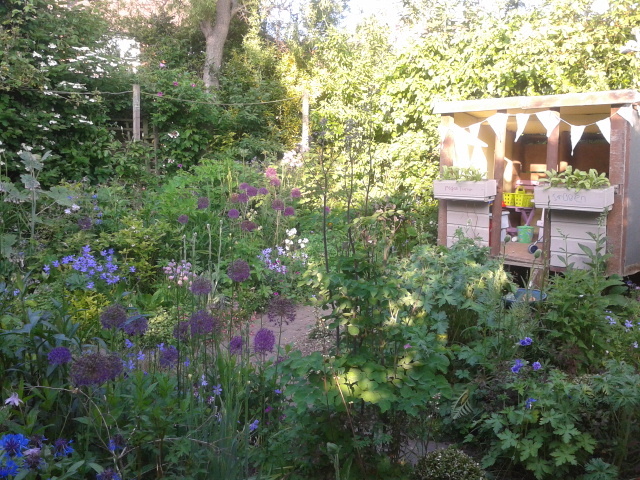 Taking time out from all this work, around the garden, summer is proving bountiful already. 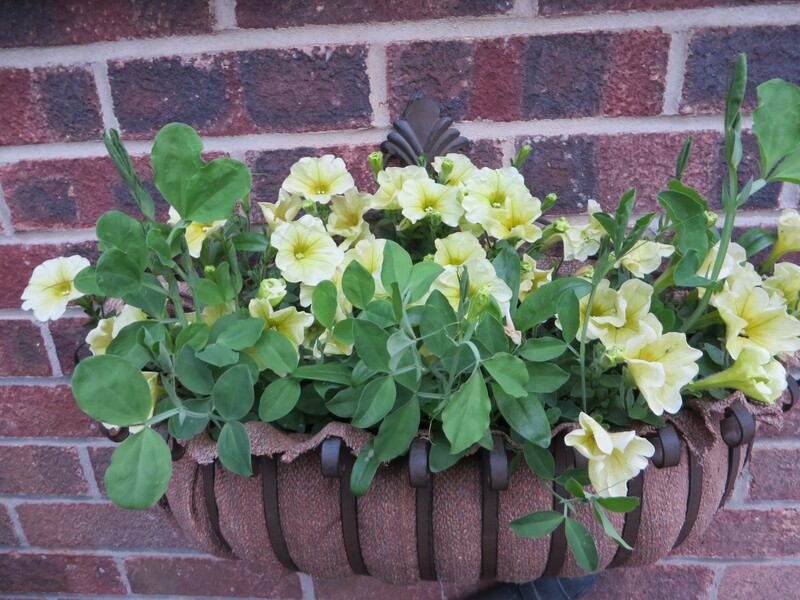 The Hay Basket is filling nicely with petunias and bijou sweetpeas and to follow, trailing begonia. 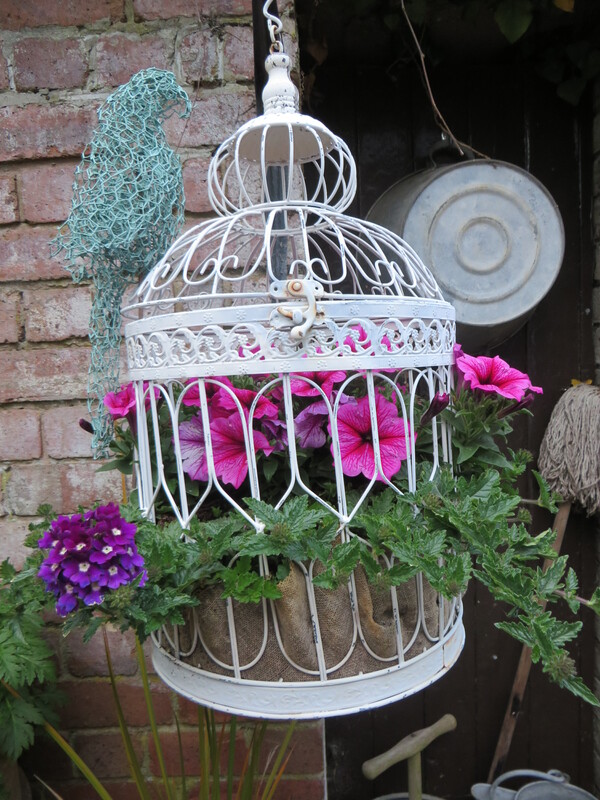 The Birdcage is looking pretty with pink petunia and purple verbena. 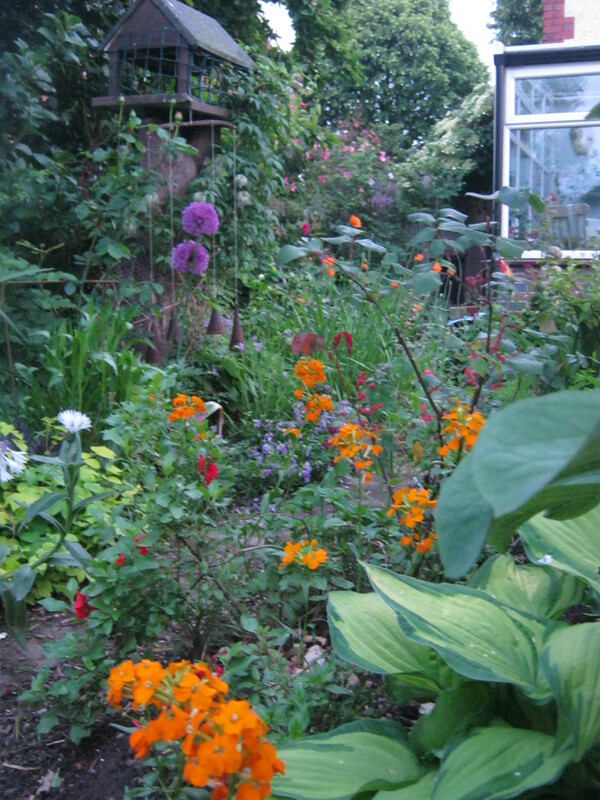 I was a 60s teenager and the colours we wore then have in some way shaped the colours of my garden. I love putting orange with pink and purple, somehow it always looks right. 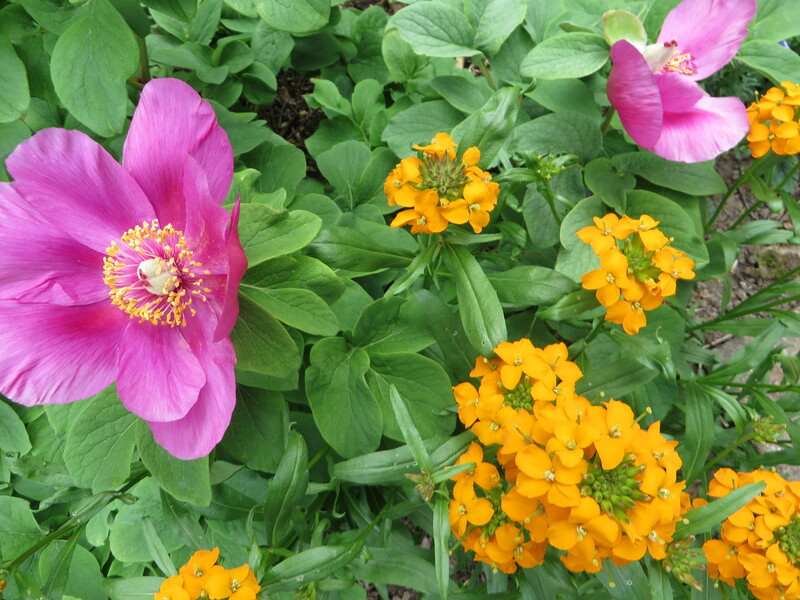 Orange wallflower with purple alliums and red salvia. 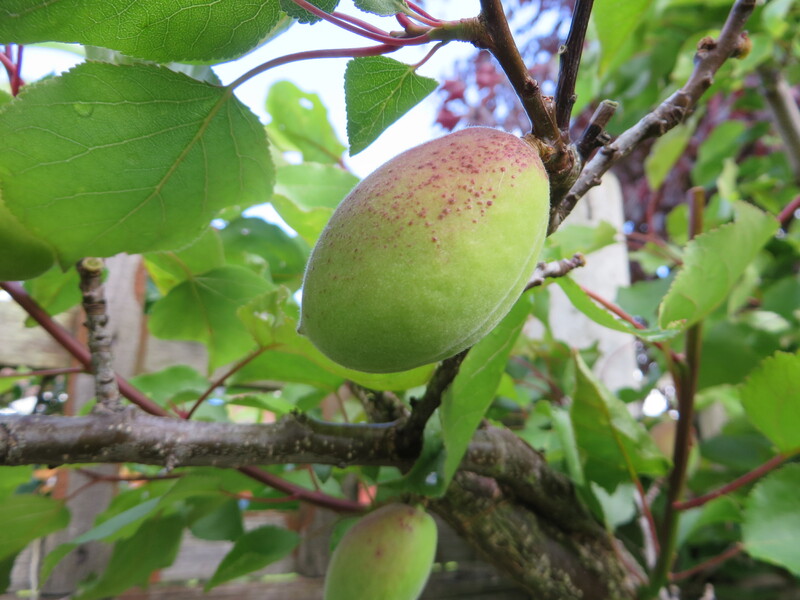 Also this year I have a good crop of apricots, keeping my fingers crossed, I don’t lose any. In the past 4 years since I have had this I have only had 4 apricots off, but this year I’ve counted 20+. 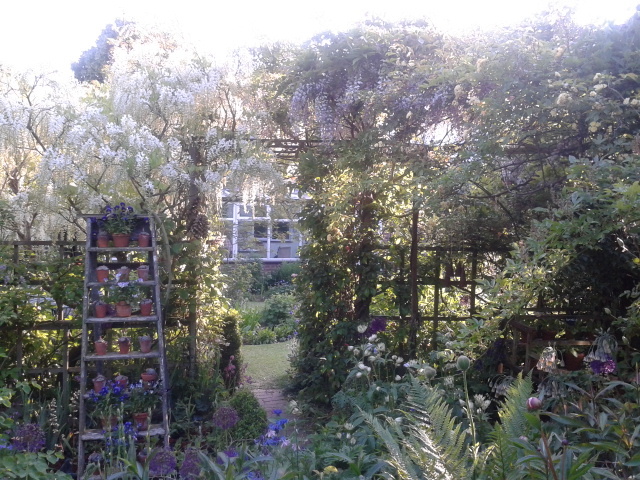 Planted on a south facing fence and grown as an espalier with two tiers. 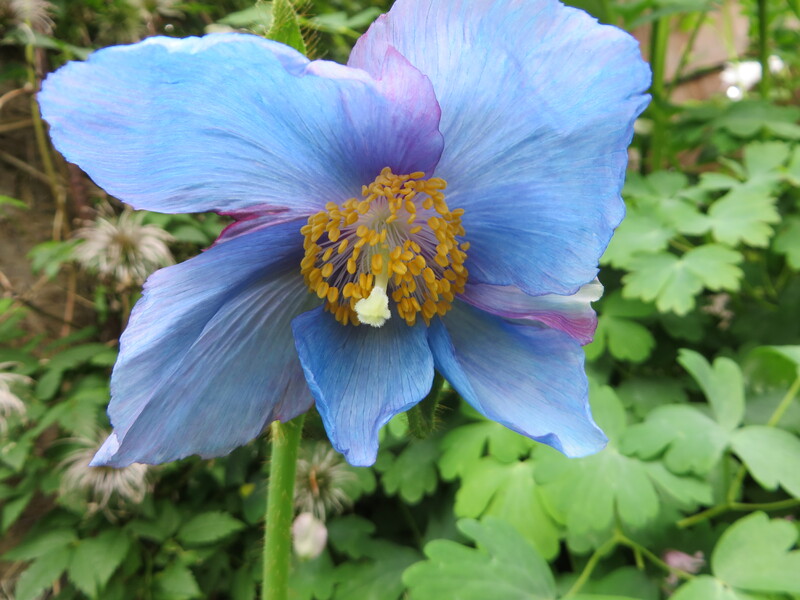 And to finish…..Last year my sister in law gave me a seedling of meconopsis baileyi…and look what I found this week. 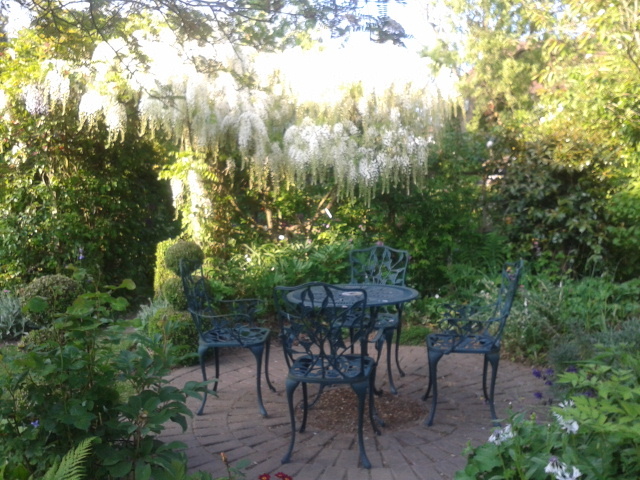 A perfect end to a busy week. 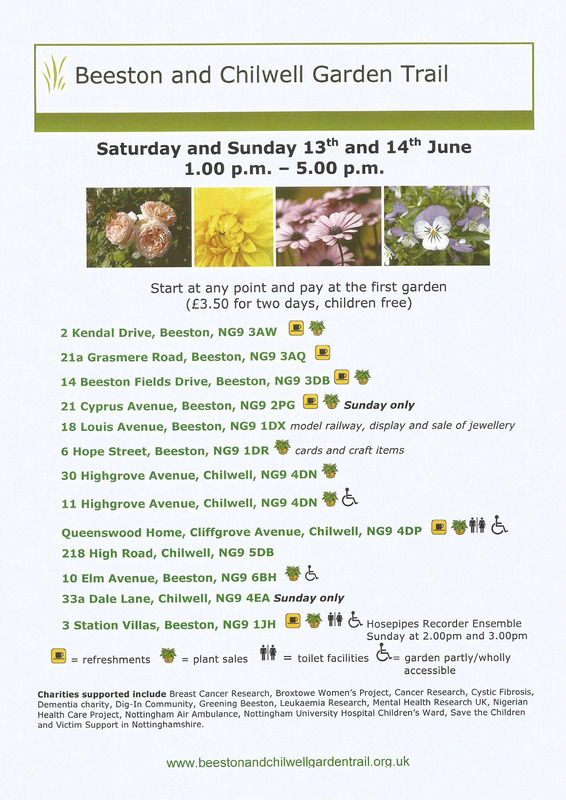 And for all my followers who are local here is the poster for the trail….hope to see you …. 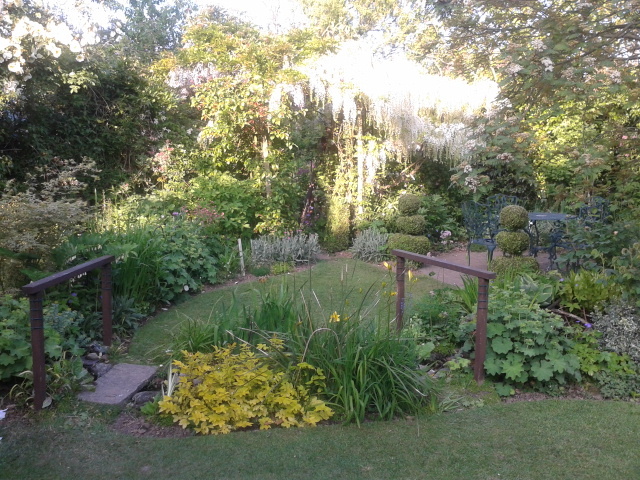 The following photos were sent to me by my lovely sister-in-law Mary, she had taken them during our open day last June. 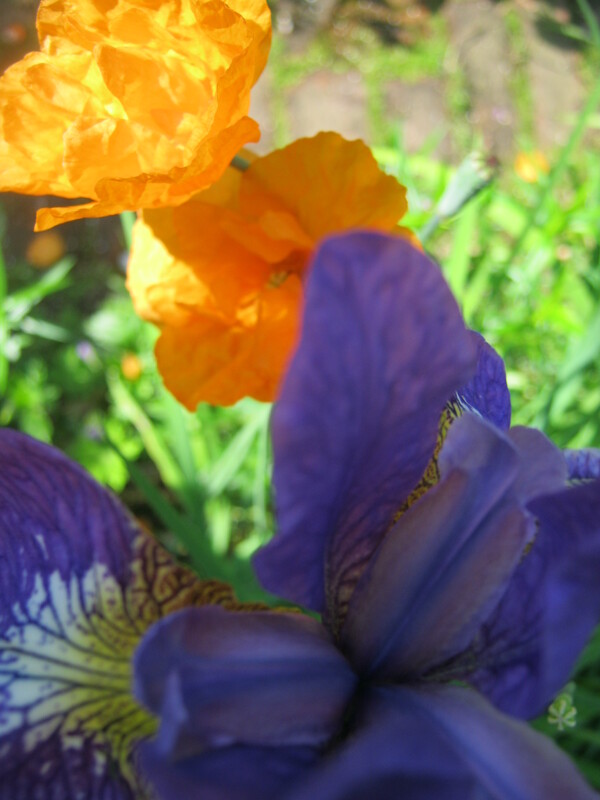 I thought we could all do with a little sunshine, I know they have brightened my day….. 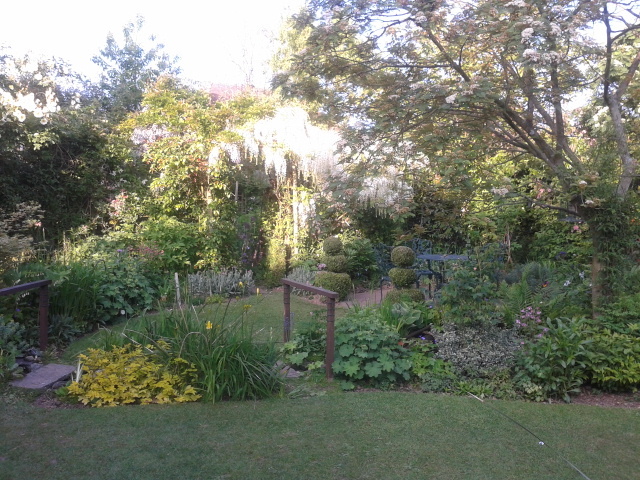 The sun may have been a bit bright on some of them but you get the feeling of early summer….roll on June 2014…..